If you’ve ever been in Italy before Easter, you know the joys of Carnevale. Although Venice is world renowned for it’s amazing Carnevale parties, costumes and celebrations, but other areas of Italy are also in the spirit of full on celebrating before the deprivations of Lent. The kick off for Carnevale is February 17th, this year. Venice is an exceptional exprience at this time of year, but celebrations are held all over Italy from Venice and Milan down to the villages and towns of Sicily. 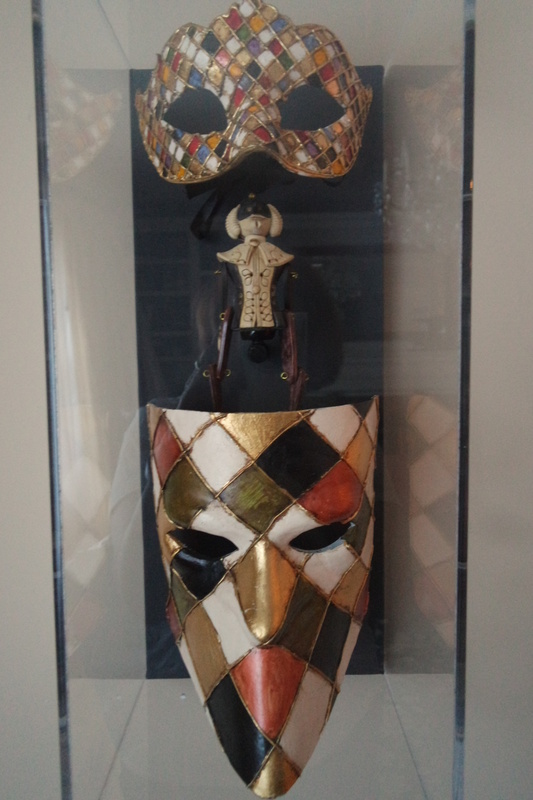 The celebration of Carnevale is the Italian version of Mardi Gras. of beads. Originally, Carnevale used the costumes and masks to allow the people to mingle, the rich were not recognized and the poor could parade as if they were equal and no one would know. And, there were plenty of women who chose to dress as men, and vice versa. Today the costumes and masks continue to captivate young and old. And, each area of the country has their own way to celebrate. 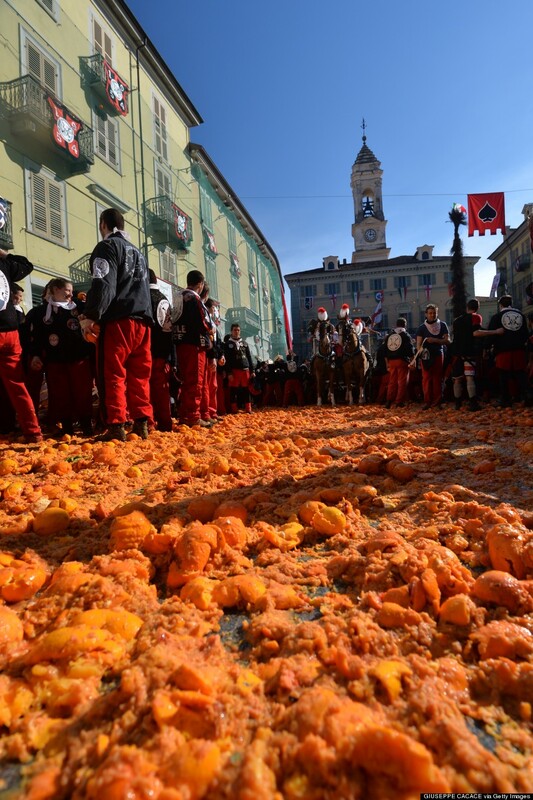 In the past few years, Ivrea, which has been celebrating this way since the 1600’s has been getting more attention because part of their celebrations is to throw 400 tons of oranges. Yep, 400 TONS. This is the celebration of the town uprising against the regime in power. It’s very much like our Boston Tea Party, although much messier. Like most Italian events it is accompanied by a parade, a palio (competition) and then a huge feast, and of course, fireworks displays. 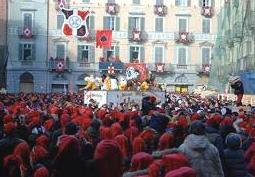 There are many cities throughout the country that have equally unique Carnevale celebrations. In Viterbo, which is just north of Rome., the commune of Ronciglione has become quite well known for their celebration. They have been celebrating for more than a century so there is a well established program. They have a “King of Carnevale” who takes over the town from the mayor and begins the parties. He’s followed by riderless horses running through town. There are days of horse races, parades with floats, parties and confetti thrown. And, of course, lots of food. Then there is Rome. Since about 2010, Rome has re-invented their Carnevale. And, the celebration seems to be growing very quickly. Carnevale is very much for the kids and family in Rome. For them, it is a combination Halloween and Christmas and they love being in costume. There are many events to entertain the children from the Zoo having special programs, to horse shows and competitions and some racing. 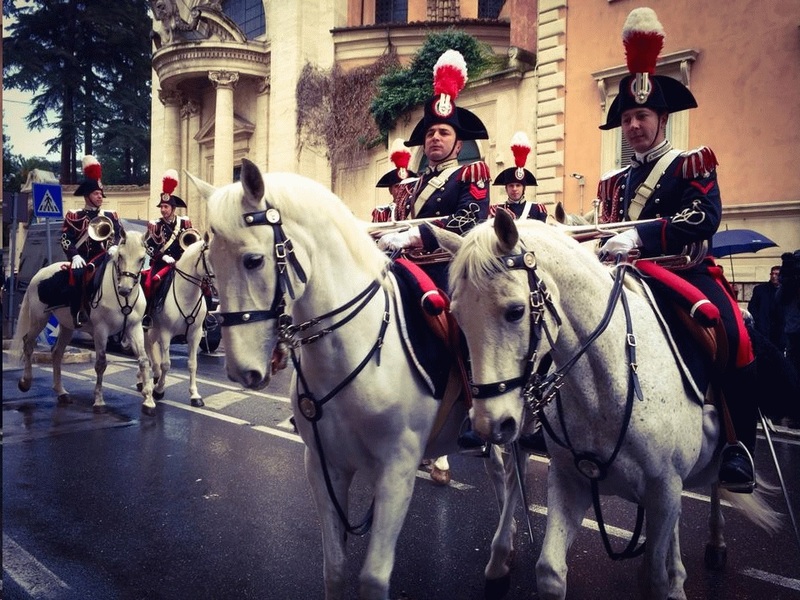 Rome’s Carnevale, it has always been about the horses. The most well-known of Rome’s annual carnival events is the horse-drawn parade taking place along Via del Corso at 16.00 on 17 February. Involving more than 100 horses and carriages, the parade evokes the Berber horse race that was historically the most important event of the Roman Carnival until 1874 when it was abolished by King Victor Emmanuel II due to the death of a spectator. The finale is a really spectacular fireworks display in Piazza del Popolo. There is always a full program of musical performances when there is a celebration in Rome and certainly there are many of all types of music available this month. Piazza del Popolo and Piazza Navona are both centers filled with children and families watching the street performers, puppet shows and throwing confetti on everyone. It’s great fun. This year Rome Carnevale celebrates Queen Christina of Sweden on the 360th anniversary of her arrival in Rome, with a number of initiatives organised by the city in collaboration with the Swedish embassy and the Swedish Institute of Classical Studies in Rome. So you can expect many art exibitions and musical programs for this tribute. Ahhhhh. And the food. Never forget the food. Like most things in Italy, although the sweets may be similar, each region has their own name for them. In Rome, the most popular sweet, and only available during this time is the frappe. Frappe are flat, crisp sweets often covered with powdered sugar. They are also called Frappole, Sfrappole, Flappe in central Italy, Cenci (“tatters”) orDonzelli (“young ladies”) in Tuscany, Crostoli (“crusts”) or Galani in Veneto,Lattughe (“lettuce”) in Romagna, Nastri delle Suore (“ribbons of the nuns”) in Emilia, Bugie (“lies”) in Piemonte, and Gigi in Sicily. I am drooling just thinking about those sweet crunchy treats. But, don’t forget to try the bigne, which are filled with cream, usually yellow, but sometimes you can find a cream of a different flavour; and castagnole are fried balls of dough about the size of a chestnut covered in sugar. I have a great recipe for castagnole. They are a little like a cake doughnut. You just pop them in your mouth and it is amazing how many you can consume before you even realize it. The sugared balls are very popular, but there are also the gorgeous ones that are done by first dipping them in Alchermes, the blood-red Florentine liqueur, before the sugar coating: the ‘bath’ in the liqueur gives them a look of tiny peaches. Here’s a recipe so you can try them yourself. Place the flour, sugar and baking powder together in a large bowl. Create a well and add the butter and eggs and lemon zest. Begin beating the ingredients from the center and slowly incorporate the flour. (This is the same mixing process you use to make pasta!) Mix until all the flour is absorbed and a thick dough is created. Cover and let rest for 30 minutes. Divide into four parts and roll each part out into a long cord. Cut each cord into chestnut-sized pieces. Heat the oil for frying. Deep fry the dough until golden. Remove from the oil and place on a tray with paper towels. Let drain for 1 minute. Quickly place in a bowl with the Alchermes (if using) and roll to lightly soak the balls. Remove from the Alchermes and place in a small paper bag with 1 cup of granulated sugar and shake to cover lightly with sugar. If you do not use the Alchermes, just put them directly into a paper bag with the sugar and coat. They are best eaten warm, but can also be served at room temperature. I do not know how long they keep, I have never had any left over. This entry was posted in Cooking Italian, Rome, travel, Uncategorized and tagged Campo dei Fiori, Carnevale, Carnival, Food, Frappe, Italian travel, Italy, Mauro Berardi, spices.